The summary that follows and the full research paper are working documents. Your comments are welcome here, or for in-depth feedback, please use the wiki version. Since its October 2015 conference, Experience Engagement, cohosted with the Agora Journalism Center at the University of Oregon’s School of Journalism and Communication, Journalism That Matters (JTM) has been using a research and evaluation practice designed for learning from complexity — Developmental Evaluation — to understand the relationship between community engagement and journalism, grounded in the belief that engagement offers a pathway toward improved trust in media. To be a thriving, resilient ecosystem, communication needs to go beyond “reporting” what is happening in the ecosystem to providing robust information and inclusive dialogue, fostering collaborative action that achieves community goals. What would journalism look like if it were generated from within community rather than FOR community? That question led us to consider, what if it’s not about journalism per se, but more broadly about all kinds of communication, with a mission to support communities and democracy to thrive? This report focuses on what we have learned using Developmental Evaluation with several community engagement projects, two of them in partnership with journalism organizations. In brief, we found that when journalism is at or near the center of focus, it gets in the way of reinventing thriving local communications ecosystems. Innovations are more likely to come not by looking narrowly through the lens of journalism but by imagining this emerging ecosystem through a broader perspective, one that considers digital, cultural, demographic, and technological shifts while also drawing from traditional elements of journalism. In fact, journalism can benefit from observing the emerging ways many disciplines — including open government, participatory democratic practices, and regional sustainability — are becoming transparent and collaborative with residents in designing thriving communities. We see our task as not reimagining and reinventing journalism but rather imagining and inventing inclusive, generative communications ecosystems that foster thriving, resilient communities — what we call “civic communications.” With community at its heart, it makes room for all voices to be heard, all peoples to be seen, and residents to be informed and in action on issues of importance to themselves and their communities. 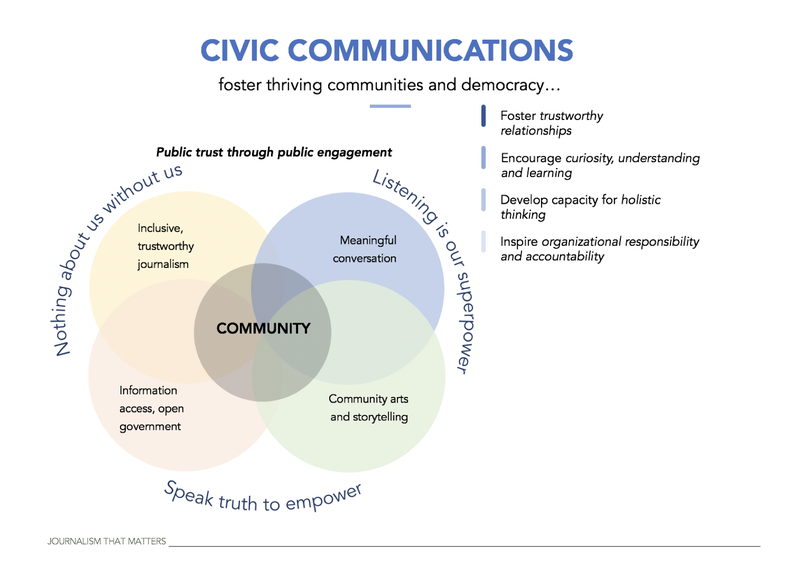 The diagram above captures the key elements of our evolving civic communications framework.